Last Sunday, I watched a movie called Deadly Delicious. In that movie, the husband had an extramarital affair with another woman. He thought his wife didn’t know but actually she already knew this. To revenge, she found that woman and taught her to cook delicious food for her husband. Sounds strange, isn’t? The wife taught that women to cook some food that were really good for her husband’s health. Then she cooked some food that could destroy his health after he came back. One of the dishes she cooked for her husband was fried prawns. This dish almost killed his husband. She knew that his husband had Vitamin C so that she cooked prawns for him. Why? Prawns +Vitamin=Poison. The arsenic pent oxide in the prawns reacts with vitamin C to produce arsenic trioxide, which is very poisonous. I searched to confirm if it this was true. The result was not satisfying. Some one said “Yes” while others said “No”. So I am wondering if you guys can give me the answer. GUESTITS Rubbish; i always taken and continue to take mega dosage of vit C (1000mg) even after dining on seafood containing jumbo size prawns. Still living healthy! GUESTITS? Are you kidding? I searched much info and most told me that you shouldn't have Vitamin C and prawns together. Vitamin C is a harmless vitamin whilst providing some benefits it is IMPOSSIBLE to overdose on, any surplus amount is simply not absorbed by your body. Zoey, I got the same info like you. Thus, I am not going to try them. I did a web search and came up with this post from the Internet debunking site called Snopes. It says that prawns + vitamin C does not equal arsenic poisoning. GUEST74135 Marine organisms normally contain arsenic residues ranging from < 1 to more than 100 mg/kg, predominantly as organic arsenic species such as arsenosugars (macroalgae) and arsenobetaine (invertebrates and fish). Bioaccumulation of organic arsenic compounds, after their biogenesis from inorganic forms, occurs in aquatic organisms. Bioconcentration factors (BCFs) in freshwater invertebrates and fish for arsenic compounds are lower than for marine organisms. Biomagnification in aquatic food chains has not been observed. Background arsenic concentrations in freshwater and terrestrial biota are usually less than 1 mg/kg (fresh weight). never hear about it! But i know after we eating seafood we can't eat fruits! But i know after we eating seafood we can't eat fruits! Yes, you are right. Eating fruits after having seafood is bad for your digestion. It might cause dizziness, vomity, stomache and some other symptoms. To be more precise, you shouldn't eat grape, hawkthorn, persimmon and guava. If you really want to eat fruit, please wait for at leat for one hour. "These results suggest that AA is not likely to increase the antineoplastic activity of arsenic but could provide protection to both normal and neoplastic cells." Bunch of old wives tales. I have eaten seafood and especially prawns all my life and we garnish our seafood with lemon juice and often serve it with fruit and also eat fruit salad and icecream for dessert. We could list a lot more dangerous chemicals that are consumed everyday but the dangers to our health are continually ignored!!!!! 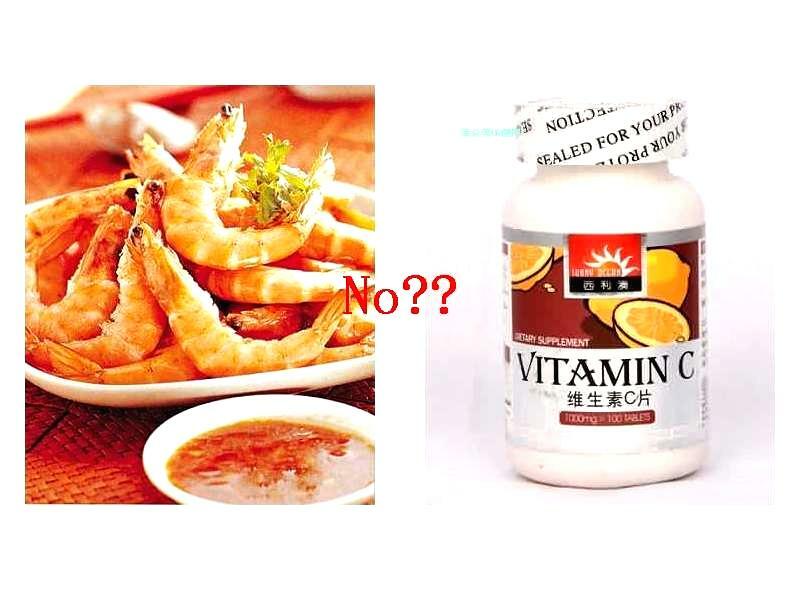 Post a Reply to: Prawns + Vitamin C=Poison?